The attachment is standard or special auxiliary devices intended to be fastened to or joined with one or more components of the milling machine. These devices increase the capability of milling machine. One machine can perform number of operation by using various types of attachments. 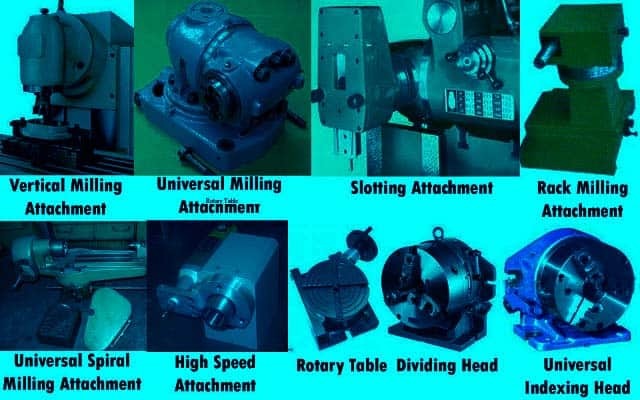 The following are the different type of attachments used on standard or column and knee type milling machines. (a) To hold the cutters. Arbors, Collets, Adaptors, etc. (b) To hold the workpiece. To hold the work piece on the table, in a desirous position, and impart additional movements, if required; such as vices, circular table, indexing head, tail stock, etc. (c) To act as auxiliary spindles. Attachment used In conjunction with the main spindle, in order to avoid the necessity of various special types of machines; such as vertical milling attachment, spiral milling attachment, slotting attachment, etc. Special attachments are those which are specially designed and used on a standard milling machine to make it suitable for performing special milling operations in mass production of identical items. These attachments mainly include the various milling fixtures. A vertical attachment can convert a horizontal milling machine into a vertical milling machine by orienting the cutting spindle axis from horizontal to vertical for performing specific operations. It consists of a right angle gearbox, which is attached to the nose of the horizontal milling spindle by bolting it on to the column face. It can accommodate cutters like end mills, face mills, T-slot cutters. It is same like vertical milling attachment but has swivelling adjustments so that its spindle may be set at any angle. It is mounted on the column and gets drive from the main spindle of the machine. The spindle speed is faster than the regular spindle by 1 ½ times to 3 ½ times. Its advantages are the spindle can set at any angle to mill angular strips; table ways etc. angular and end mills may be used to carry out the operations. An attachment converts the rotary motion of the spindle into the reciprocating motion of ram by means of an eccentric or crank housed within the attachment. It is bolted on the face of the column and can also be at an angle for machining angular surfaces. The length of stroke can also be adjusted, usually ranges from 2”- 3”. The attachment consists of a gearing arrangement enclosed within it’s casting to increase the regular spindle speeds by 4-6 times. This is for operating the smaller diameter of cutters efficiently and at the proper cutting speed. The universal spiral attachment may be used in plain milling machine or in universal milling machine for cutting a spiral grooves on a cylindrical work piece. The attachment is bolted on the face of the column and its spindle head may be swivelled in a vertical or horizontal plane. While using on a plain milling machine the cutter mounted on the attachment may be swivelled to the required helix angle for cutting spiral having angle more than 45 deg. A rack milling attachment is bolted to the face of the column and is used for cutting rack teeth on a job mounted on the table. The attachment consisting of a gear train enables the spindle axis to be oriented at right angles to the machine spindle in a horizontal plane. The successive rack teeth are cut by using a rack indexing attachment. The slanted rack teeth or a skew rack may be machined when the attachment is mounted on a universal milling machine where the table may be swivelled to the required helix angle. A rotary attachment is used on a variety of circular slots or some contours on die making jobs. They are manually operated and some take the drive from the lead screw for automatic functioning. This is also a special work holding device, which is bolted on the machine table. The work may be mounted on a chuck fitted on the dividing head spindle or may be supported between a live and a dead centre. The dead centre is mounted on a foot stock as in a lathe tailstock that is bolted on the machine table after correctly aligning its spindle axis with the dividing head spindle. The attachment is principally used for dividing the periphery of a work piece in equal number of division for machining equally. This attachment is used both as horizontal and vertical dividing chuck. The universal indexing head is the most common type of indexing arrangement used in workshops. It can be used to execute all forms of indexing.